Acquiring a perfectly green lawn is one of the most sought-after aspects of an American Household. There’s even a popular saying that the American Dream is often accompanied by the smell of freshly-cut grass. This just goes to show you how important a well-kept front yard is to the average american. In decades past, the inhabitants of any given community could gather and compete for who could create the greenest and most beautiful front lawn in the neighborhood. Those competitions still exist today, but have evolved into of landscaping and garden design challenges. With the advances in fertilizing and gardening technology, sporting a beautiful lush front lawn is much more simple than how it was a few decades ago. Despite all the amenities we have access to nowadays, maintaining a green lawn still requires quite a bit of preparations, one of which involves picking the right fertilizer. But in a world where there are literally hundreds of fertilizers available on the market, which should you choose, and why? Spring and summer times aren’t the only seasons in which you should be fertilizing your grass, and we’ll tell you why. 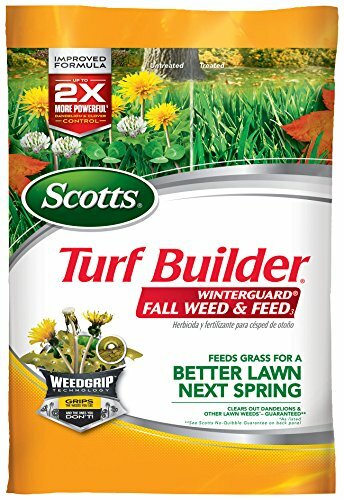 Scotts is a brand of the Scotts Miracle-Gro Company, the biggest lawn and garden product manufacturer in North America and one of the biggest in the world. They have significant presence in the United States and Canada, and also most of Europe and, to some extent, the Asia Pacific region. Besides functioning as top-of-the-line lawn food, this fertilizer also promotes deep root growth, boosting the grass’ ability to absorb nutrients from the soil, even through the cold fall and harsh winter. 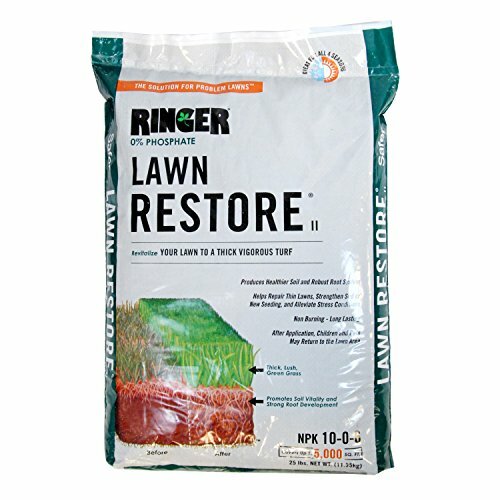 This product guarantees that you will have greener, stronger grass throughout all the fall. In the next spring, after the snow has thawed and nature starts blossoming once again, your grass will be as green and strong as ever, like nothing ever happened. Once again, from the hands of the Scotts Miracle-Gro Company we have the Miracle-Gro Lawn Food. This is a highly versatile product, capable of providing nutrition to any and all types of grass. This product contains high quantities of nitrogen and iron, which promotes the growth of deep green blades of grass, as well as deeper roots for increased nutrient absorption from the soil. The Safer Brand of lawn care and gardening products has but a single goal in mind with all their creations: to promote the use of organics in order to improve the quality of plants and crops, while also preserving the environment. For the last 30 years, this company has dedicated its trade to creating the best organic products for pest control, fertilization, and everything else a gardener would need in his or her journey to achieve the perfect lawn. This specific product is specially formulated with nitrogen and potassium, but no phosphorus. The presence of phosphates negatively affects aquatic life once it is mixed with water, such as when the turf is watered after applying the fertilizer. One of the best features of this product is, since it is organic, it is also completely safe for pets and children. With this product, you won’t have to worry about your dog or children being exposed to the fertilizer. Even if they were, it wouldn’t do them any harm at all. Yet again, Scotts makes another appearance in this list; this time with their turf builder lawn food. Similar to our first entry, this product is applied directly onto the grass. Its vast amount of nutrients will strengthen each blade of grass from the tip, down to its roots. A few weeks after the first use, you will notice that your grass will be greener, thicker, and possibly softer than it was before. This product is recommended to be used once in spring, and once again in summer. 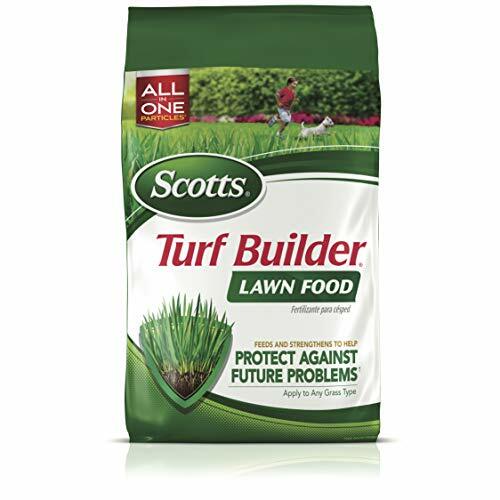 To prepare your grass for the winter, it is recommended that you use the Scotts Fall Lawn Food (our first entry). After the first year of usage, you will marvel at the difference compared to when you weren’t using any fertilizer at all; taking “before” and “after” pictures is not necessary, but is highly recommended! This product is also pet-friendly, so feel free to let the kids and dogs run around the lawn after you’re done fertilizing it. What better way to close this list than with another Scotts product? This just goes to show you that this is one of the best lawn fertilizer brands out there. This product is perfect for those that want a fresh start in their garden. Perhaps you had a particularly bad winter, or accidently burned your lawn with another fertilizer? If this is the case, then this grass starter is just what you need. Designed for growing grass from scratch, this heavy duty fertilizer offers a generous 24-25-4 NPK ratio, which will greatly boost the grass’ blade and root development. When this product is correctly administered, you will notice your grass growing up to 70% thicker and 35% faster compared to unfed grass. All you have to do is add the indicated amount to the soil during the sowing process, and let the product work its magic. Either if you are a long-time gardener or a beginner to the trade, your plants will definitely benefit from proper usage of an appropriate fertilizer. When choosing the right fertilizer for your plants, there are certain elements you have to consider, such as the requirements in their different stages of development. However, with grass it is a much more simple matter, since they are all similar, even when considering different types of grass. Nevertheless, since there are many variants of fertilizers in the market, it’s easy to get lost among the sea of options available to us. In that sense, a great tip would be to search for user reviews on your favorite online store and get informed before making a purchase. 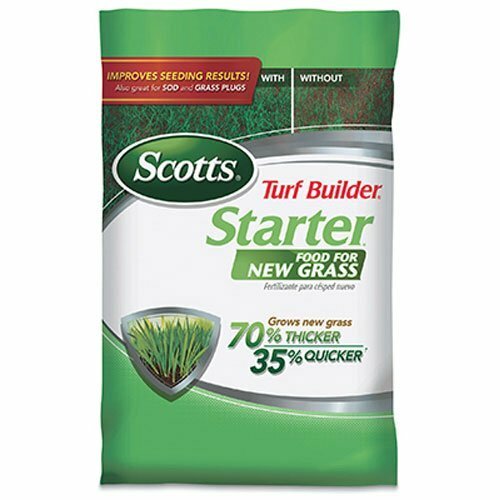 As a general rule of thumb, when it comes to turf fertilizers, Scotts will always provide some of the best options in the business. A good starting point would be to browse the products sold by this company and find the one that best adapts to your requirements. Naomi runs the Garden section of OutdoorAuthority. When she isn't in her garden, you can find her working at the community center and doing everything she can to learn more about gardening. Have questions? Ask away!